TUCSON. – Tucson Station Border Patrol Explorers from Post #181 successfully completed the Southern Arizona Law Enforcement Explorer Academy in Oro Valley. The young men and women of graduating class #118, celebrated their accomplishment surrounded by friends and family at the Oro Valley Church of the Nazarene. The academy, hosted by the Oro Valley Police Department, welcomed several posts from Tucson area police departments such as, Tucson, South Tucson, Sahuarita, Marana, and Oro Valley. Command staff from all the participating agencies attended the ceremony to congratulate the explorers, including Tucson Sector Chief Patrol Agent Rodolfo Karisch, who praised the accomplishment of the post and presented them their certificates. The ten graduating Border Patrol explorers are local area students ages 14 through 19, who meet regularly at the Tucson Station. 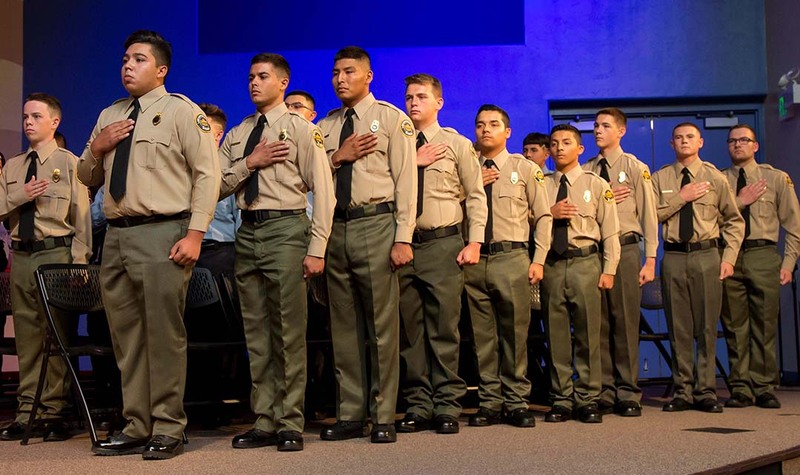 Throughout the program, explorers receive a glimpse of what a law enforcement academy is like, learning the basics of law enforcement and community service through volunteering. Explorer programs are sponsored by the Boy Scouts of America Learning for Life program and are hosted by most Border Patrol Stations. These programs provide local youth an extracurricular option to explore law enforcement careers, and enjoy team-building and scenario exercises. Additionally, explorers must maintain advanced academic standing at their school while enrolled in the program. Many explorers move on to become leaders within their own communities. Some have become military officers, college educated professionals, and even Border Patrol agents.